There’s a steady breeze blowing. The sand is black—it’s volcanic—flecked with small crystals that twinkle in the sunlight. The sand is quite hot too in the heat of the day…best to wear flip-flops. Waves hit the shore rhythmically as the tide comes in. It’s a protected cove, with steep cliffs rising on either side. The rocks just below them provide great opportunities for snorkeling and checking out a dozen species of tropical fish. Reggae rhythms drift on the wind out of the beachfront bar and restaurant set just back from the beach and blue, white, and black feathered magpie-jays make their presence known by landing on the gnarled branches of trees near the shore. These stunted trees provide the perfect shade as you watch the fishing boats anchored in the cove bob in the swell. Occasionally, fisherman row in after anchoring their open boats with outboard motors, called pangas, weighed down with bags full of just-caught tuna, dorado, and snapper. You can head out too. A small shack on the beach offers sport fishing tours on modern, fully-outfitted boats…or you can go local in one of the pangas for half the price. 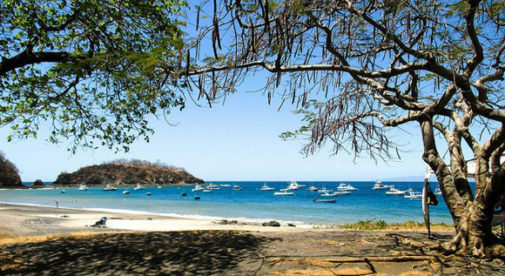 I lived an hour from this beach for nearly a year here on Costa Rica’s northern Pacific coast. But I just never made the trip. I didn’t know what I was missing until my family and I took a Saturday drive from our home in Tamarindo to this beach community to the north, called Playa Ocotal. Ocotal is off-the-beaten path, it’s mostly residential and very quiet. And there is limited space to park, so it doesn’t get very crowded, even on weekends. That’s just the way the small group of expats who live there full-time like it. In Ocotal, you see fancy condos and homes set on the hills and cliffs above the water. For a location and view like this in coastal California you’d pay millions and have neighbors right on top of you. But in Ocotal a large luxury ocean-view home set by itself on the hillside goes for well under half-a-million dollars. Here development is more low-key and spread out—it doesn’t spoil the natural beauty. Head inland, but still a quick walk to the beach, and you’ll find real bargains in gated condo and townhouse communities. A two-bedroom condo, fully-furnished with two community pools, from where you can walk to the beach, is available for $185,000. Nearby, up the hill, is a two-bedroom condo, again, a short walk to the beach, for $99,500. Father Roosters is the restaurant in Ocotal. A brightly-colored wood building dating back to 1917 with tables set out front with an ocean view—specifically the Gulf of Papagayo. Of course, there are the obligatory hammocks and beach loungers when you just want to relax. The porch offers shade, as do the umbrellas on the tables. It’s the perfect place to enjoy the ideal antidote to the tropical heat: An ice-cold michelada (a beer cocktail of lime juice and a light beer, with ice and salt on the rim) for $3. Just be sure to snag one of the tables facing the water if you’re there in late afternoon so you get the best sunset view. There are a few small stores in Ocotal, along with the aforementioned restaurant. 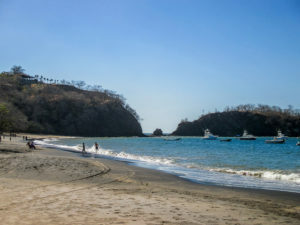 But head to neighboring Playas del Coco, about a 10-minute drive to the north, and you get to one of the major hubs for tourism and expat life in Costa Rica. You have everything you need there…banks, medical clinics, great bars and restaurants, and a lively malecon where you can take an evening stroll. It’s the best of both worlds on this part of the Pacific coast.